Erifili Tsironi has been Navios Maritime Midstream Partners L.P's Chief Financial Officer since inception. Ms. Tsironi has over 17 years of experience in ship finance. Before joining Navios, she was the Senior Vice President-Global Dry Bulk Sector Coordinator of DVB Bank SE. 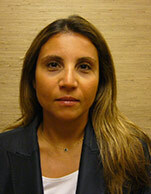 Ms. Tsironi joined the Bank in 2000 serving as Assistant Local Manager and Senior Relationship Manager. Previously, she served as account manager in ANZ Investment Bank / ANZ Grindlays Bank Ltd from May 1997 until December 1999. Ms. Tsironi holds a BSc. in Economics, awarded with Honours, from the London School of Economics and Political Science and a MSc in Shipping, Trade and Finance, awarded with Distinction, from Cass Business School of City University in London.